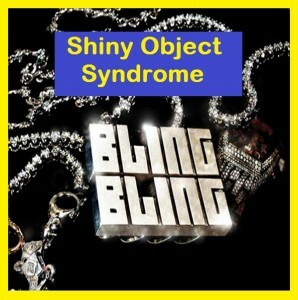 Is the Shiny Object Syndrome Affecting Your Internet Marketing Plan? The shiny Object system seems to plague so many internet marketers these days. It can turn one’s focus into an ADD or ADHD oblivion. Here is a real life example of how to keep your internet Marketing Plan on track and keep the dollars coming in. Recently, a person new to the business I’m in, posed the question, “How do you moderate and filter out all the shiny objects and done for you systems in internet marketing today without losing focus?” Here was my response. But first, let me set the context. I belong to a company called My Online Business Empire or MOBE (the Matt Lloyd Company). People here make up to 6 figures per month and some make 7 figures per year. Many of us no longer have bosses nor do we trade time for money (aka a job). Vacations happen when we want them to, not when some boss tells us maybe you can have off a few days in 6 months. We don’t miss our kid’s football games and dance competitions because of a boss. We are very elite group internet marketers and we have, collectively, taken the guesswork out of affiliate & internet marketing. It still requires quite a bit of hard work and perseverance, but the blueprints are here for the taking. So here is my response to the question above: “Well, that’s a reasonable question. Here’s my 2 cents: you’re venturing into the very expensive, redundant (in light of the company you are now keeping), and inefficient path of the “Shiny Object Syndrome”. Now, is the exact wrong time to go down that path. It’s also unnecessary, since the wheel has already been invented for you. You have the blueprints for the highest commissionable, core offers in the industry (in MTTB, LR, Titanium, & Platinum); and with that you have access to the best and probably only legitimate phone closing team in our niche (yes they call our contacts and close the sales for us). On top of that, John Chow has given you the perfect amount of core tools to make it happen within MTTB’s 21 steps/30 day traffic… your blog, Leadpages, Linktracker, Aweber, etc… all explained in the e-book and MTTB Elite (by invite-only website). This is not to say you shouldn’t expand your portfolio eventually; but you have more than enough to focus on at the moment.” So that was my response and it’s the best advice I can give anyone, newbie or even a seasoned internet marketer. So my question to you is, “Are you also affected by shiny objects and is it affecting your internet marketing plans”? Look, I get it. There are more than a few ways to make a buck in this world and in internet marketing. Every work from home business is different. But for every person of integrity who offers you a way to make money online, there are 100 snake oil salesmen who are just hoping to distract you and blatantly steal your money. So how to you recognize the genuine article when you see it? Simple; you need to see Testimonials (and we have a lot). That is the sole reason Matt Lloyd as opened this opportunity up to so many people. Sure, I’ve met him a few times and I think he’s a good person. But he does this, by and large, so he can get your testimonial. There’s nothing more powerful than word-of-mouth to make a business take on a viral footprint. Now MOBE has paid over 5 million in commissions this year to people just like you and me. Many of those people have given their testimonials. You can view many of those testimonials in my free newsletter and (or) MTTB, which is a 21 day coaching program. Whatever you do, whether you want to join my business or some other, find one you believe in (based on real evidence), and stick with it. Because one thing is for certain, you could have the best internet marketing or affiliate marketing business in the world; but if you become affected by the Shiny Object Syndrome at the wrong time in your career, you’ll never get your feet off the ground. Your work from home business can dome to a screeching halt. Make your internet marketing plan work for you and not the other way around.